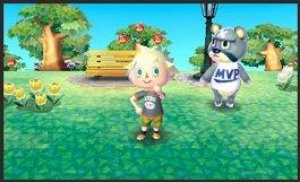 Rather like Retro Studios' stab at revitalising Donkey Kong, this is another rumour from last week that turned out true: Animal Crossing is heading to 3DS, as these screenshots prove. Although the core graphical styling is unchanged from previous outings, the graphical improvement over the DS's Animal Crossing: Wild World is clear – textures appear crisper, with an eye for detail that wasn't possible on DS. With little information available it's tough to tell how big a leap this will be over the previous entries in the series, and with existing furniture pictured in the screenshots it's clear this game won't be a radical overhaul of the gameplay system, but as soon as we have more facts we'll update this page to bring them to you. Until then, feast your eyes on these screenshots and the taller, leaner figures contained therein. I bet the cylindrical world will be a mindrape. I gave up on the Animal Crossing series a while ago, but this looks pretty good. At least they fixed up the graphics a bit. One of my top five favorite franchises these days. Like the new look, and I'm very excited to hear new details. It's good that the rumour was true, animal crossing works best on handhelds. Well, I guess I'll have to wait for some more information, but the graphics look improved, at least. Will have to know more details though before consider it. I don't like the way the characters look. Making them taller and leaner makes the game look more realistic, and that's not what the series is aiming for (anyone who says other will have to face the fact that you can't socialize and live next door to a panda bear in real life). Long Animal Crossers are long. I don't care about the visuals for this game. Is there an actual evolution in gameplay that the series HASN'T seen for a decade. I'm watching the E3 Nintendo recording now. This still looks pretty great, especially compared to original DS version. I like the people arent llittle circle and ovals. cant wait! 4th Animal Crossing hmmm i'm kinda tired over Animal Crossing but keep them coming!!! Not the overhaul that I was hoping for, but as long as they add a heap of new activities to the game then I may consider jumping back into AC. There simply isn't enough to do in the DS/Wii games. That's not true! My neighbour is a raccoon that owns a shop! The change of the art style is very welcome and amazing. So glad Nintendo are switching up the Animal Crossing formula a little bit with this title. When City Folk was basically Wild World 2, I feared the series was winding down and would die off if the next game didn't deliver a few changes to keep fans interested, but this looks great! City Folk was the update of Wild World. I played it like 2 months. It was like DS version but with "but the hat of Stacy Malibu is New". I pass this time. So happy there's going to be a new Animal Crossing. This game is always hideously addictive. Yay that the characters are taller. Now I don't have to be short in the digital world too. I absolutely hated them. WHY HORNS?! Wow, this will be great!!! It will actually look real too. Sort of. Oh, YES! Definitely, bring it on! cna't wait to be mayor in this one.